Geek of All Trades » Congratulations, Northstar! 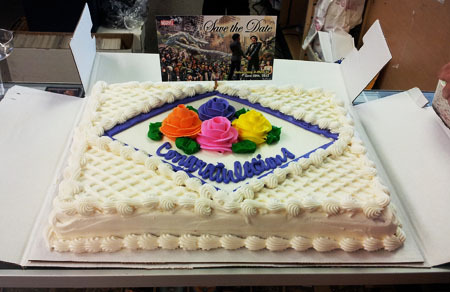 To celebrate the marriage of Northstar and his boyfriend, Kyle, my local comic store (Samurai Comics) had a celebration. They had the cake pictured above decorated with the flier for the wedding along with sparkling cider to drink. (The cake was quiet yummy!) They had a table set-up where a couple local gay groups set-up but it was pretty low key. It was a good chance to see a some friends I hadn’t hung out with in a while and even met someone new. It made for a fun afternoon. I hope everyone else got out to get their copy of the issue with Marvel addressing the issue of gay marriage. My local comic book shop didn’t have anything special. But buying this issue in North Carolina felt kind of good! I was actually pleasantly surprised when I found out about the event at the comic store I go to each week. I’ve heard that at least 1 other store in my area who also did something. I’m sorry the stores in your area didn’t have similar events but I’m glad to hear you went out and got the book.